Enter to win 2 tickets to Highland Stars – A Children’s Celebration of Light at the Brunish Theatre. For Friday, December 28, 2018 or Saturday, December 29, 2018 (afternoon shows). Entries will be accepted online now and must be received by December 8, 2018 at midnight PST. Highland Stars, a mini-Christmas Revels designed for children ages two to six, is back this year by popular demand! Highland Stars is a fun and beautiful story with three silly clowns, a raven and a friendly dragon. 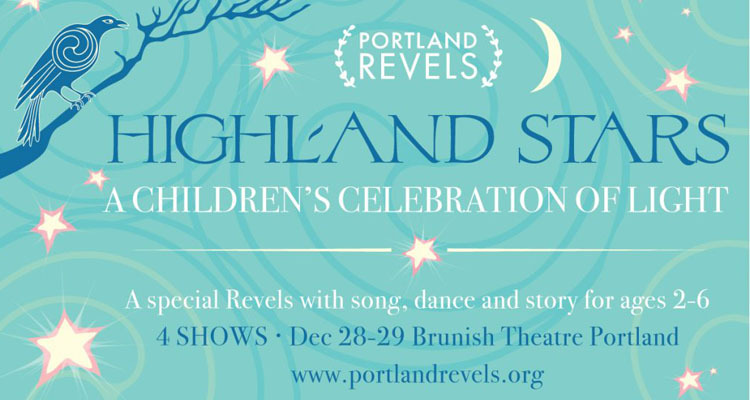 This delightful 50-minute show features Scottish choral music from the Portland Revels Children’s Chorus, the fantastic fiddling of Revels Associate Music Director, Betsy Branch, and fabulous life-size dragon and raven puppets. You and your youngest family members can join in the show, learn a traditional Scottish tune, and dance with the children’s chorus to bring back the light. Most enjoyed by ages two to six.